Thanks to generous MySpleen user ChupaX, 18 episodes of Youri, the Spaceman are now available (in English dub), as recorded by said user from Animania HD! MySpleen registration is currently open and freeleech is active, so if ever there was a perfect time to grab these, it's now! Alternatively, you can watch all 18 episodes above via Dailymotion. Big thanks to ChupaX for these episodes; I've personally been trying to track them down for quite some time and to now have 18 of the show's 26 episodes AND in great quality is just awesome! The first episode of ThatShoegazer's new music review show 2Beats+ has been released, check it out! The first 7 segments from Moxy's debut TV appearance (via 1993's Great International Toon In) have been unearthed and provided by a source who wishes to remain anonymous. Unfortunately, of the ~8 hour broadcast, said source only had enough tape to capture the first 5 hours and as such, several Moxy segments from the end are missing; in any case, this is a fantastic development and many thanks are due to the aforementioned source, your efforts are much appreciated! The segments can be seen above via our YouTube channel; MEGA mirrors of the source files are available here. The Glove and Boots "Your Ad Here" video has been recovered by Redditor saudade; big thanks to saudade for the clip's provision and to LMW user Prisoner416 for tipping us off! The video can be seen above via our Dailymotion channel and saudade's source file can be obtained here. Drawing segment with hosts Jade and Ryan and cartoonist Dave Hackett can be found at 22:05. Fragment of an incomplete Jade and Ryan segment can be found at 21:17. PIXAR Twizzlers commercial begins at 1:06. First up, we have some more Cheez TV from Damien Keizer, this time in the form of two X-Men episodes! Big thanks to Damien for once again helping add to the wiki's Cheez TV Archive, it is much appreciated. Another of PIXAR's elusive commercials has turned up; this time it's a Twizzlers ad provided by YouTuber platypuscomixII in early August. Thanks to platypuscomixII for the provision of the commercial and to an anonymous wiki contributor for tipping us off! The "Dune, yo" episode of The Nostalgia Chick has been found, courtesy of kurtdenter, who had previously downloaded a copy of the episode and who has recently mirrored it for us via Dailymotion! Cheers, kurt! All 11 Celebrity Deathmatch Hits Germany fights have been ripped from VHS and uploaded to YouTube, courtesy of DrClark Wyman! Thanks Clark, much appreciated! My Vitriol have reworked their unreleased A Pyrrhic Victory tracks into a new album titled The Secret Sessions, which is now available for pre-order via PledgeMusic! Unfortunately, this is only a move to please fans who paid money to see a new official My Vitriol album. With this release, we see a different album become a lost piece of media. Thanks and respect to My Vitriol for endeavouring to get these sought after tracks out to their fans and thanks to ThatShoegazer for the tip off. That's all for now; thanks again to all parties involved in the unearthing of the aforementioned pieces of media! In any case, the episode has been mirrored via our YouTube account and can be seen above; big thanks to Comixbear for the provision of the episode and to Joeyhorrorfan for the tip off! Earlier this month, an episode of Little Shop (an obscure 1991 animated series based on the film The Little Shop of Horrors) appeared on YouTube, courtesy of Betamax King (who presumably sourced the episode from a Betamax recording)! This new addition (ie. episode 6, "I Loathe a Parade") makes for a total of 2 episodes accounted for, of 13. Big thanks to Betamax King for providing the episode and to an anonymous wiki contributor for tipping us off! So far, September has been a pretty quiet month around here, which is why I am happy to announce that an online acquaintance of mine, Damien Keizer, has come forward as having several pieces of Cheez TV footage taped on VHS (after I posted a want ad of sorts on the Australian Vintage Video Facebook group) and has since ripped and mailed me one of the recordings! The half hour recording (which consists of a Spider-Man episode -with a handful of commercials-, two minutes of Cheez TV hosts Jade and Ryan in a cooking segment and a partially recorded episode of X-Men -again, with several commercials- can be seen above via Vimeo. But the good news doesn't stop there; as previously alluded to, Damien believes that he has more Cheez TV tapes in his possession and is going to try and find them for us! Big thanks to Damien for helping us add to our modest (yet slowly growing) Cheez TV archive; I look forward to seeing any further footage you are (hopefully) able to unearth! HUGE thanks go out to the British Film Institute, (particularly Tony Dykes), who were extremely helpful in getting us a copy of this rare PIF and allowing us to stream it for all to see! Part of my agreement with the BFI in obtaining and showing this clip is that it had to be hosted on a private streaming service, rather than YouTube or the like. Hence, I am using streamingvideoprovider.com to bring the video to you, though this service does not come free and for the first time in the site's 1 and a half or so years of life, it's officially costing me money (not counting all the times that I purchased pieces of lost media for the site out of my own pocket). To clarify, the way that streamingvideoprovider.com works is that the video is available for only a certain number of streams (2,000 streams to be exact, which they define as 20,000 minutes; ie. roughly 20,000 views), after which time, additional streams will have to be purchased to keep the video online. It is because of this that I have decided to implement a donation button (top right corner). Another part of my agreement is that I am not allowed to provide you with a downloadable version, as I normally would, so sorry about that. P.S. Apologies for the technical difficulties that resulted in the unveiling being half an hour late; I tried to get it to you guys on time, but sometimes these things just happen. Thanks for understanding and a big thanks to anyone who decides to donate! Due to the overwhelming result of our last poll, we are now officially accepting articles for pieces of media that were once lost and have already been found. This means that my less-than-successful series of Lost Media History blog posts will be phased out and combined with the regular article line up; it also marks the end of the experimental Found Media Wiki, as created by PepsiWithCoke in late December of 2013 (RIP FMW). We now have a Twitter account; while I haven't done a lot with it yet, I expect to use it as frequently as I do our YouTube and Facebook pages from here on in, so either click here or click the Twitter button in the top right of the homepage to check it out. Finally, we are happy to announce the addition of a new staff member, The Reynard! Please make him feel welcome in his new position. Well, that's all for now; as I suggested, keep an eye out for further info on this month's surprise unveiling, it's gunna be pretty awesome! So, for those who are unaware (or perhaps even for those who have simply forgotten), a few months back, I announced that I was conducting a t-shirt giveaway and that 3 of the wiki's YouTube channel's first 1000 subscribers (once that number of subscribers was reached) would be selected at random and would subsequently be awarded a t-shirt of their chosen size and colour. To be honest, it's taken longer than I originally expected to hit quadruple digits; we are currently averaging 10 thousand unique page views a day, so 1000 subscribers really doesn't seem that out of reach. Anyway, if you've not yet subscribed and would like a chance to win an LMW t-shirt, simply head on over to our YouTube page and hit subscribe. That's all for now; thanks guys! Last night, while hunting for lost media, I was lucky enough to come across a download link to the entire Dragon Ball Z: Movie Overview Special, via Polish Dragon Ball fansite dbnao.net's forums! The download links, which were originally provided by dbnao.net user RMX777 a little over a month ago, contain both the full, uncut version (with commercials) and a cut version with the commercials removed, the latter of which has been softsubbed in Polish by RMX777 (though said subs are, as of this point in time, not quite done, at roughly 80% completion). Big thanks to RMX777 for providing the aforementioned download links and for going to the efforts of subtitling the special! I, for one, will be keeping an eye out for the full subtitles come completion, as they can likely be easily translated into English. On an unrelated note, LMW contributor Afonso Gageiro has decided to create a petition to have The Henry & June Show pilot released and is seeking 200 signatures before sending said petition to creator Mark Marek. So, if you'd like to help out, send an email with your first and last name to henryandjuneshow.kablam@gmail.com. Thanks guys! Late last week, Mike over at nintendoplayer.com was anonymously emailed a ROM of the highly sought-after Famicom prototype of Monster Party, along with the instruction "for immediate release". After getting permission (out of courtesy) from Mark and Matt Nolan, who own the second known cart of the prototype and who had plans to release reproduction carts (and who, suspiciously, would neither confirm nor deny whether they had any part in the ROM's anonymous leaking), Mike has provided a download link to the ROM for all to enjoy! BIG thanks to Mike, the anonymous sender and Mark and Matt Nolan for getting this prototype out there to its eagerly awaiting fans! Early Animation Tests featurette, including "Mr. Cuke's Screen Test". Thanks to LMW newcomer Gryphoemia, (also known by her YouTube account, olivermuffinsailor) both VeggieTales’ "Take 38" and "Mr. Cuke's Screen Test" have been ripped from VHS and made available online! It's not entirely clear (at least, not as of this writing) how Gryphoemia managed to come into possession of said VHS tapes in the first place, but in any case, we are most grateful for her provision of them. For a while now, the only way to watch Tim Burton's Hansel and Gretel, was via a low quality, handheld bootleg taken during a Tim Burton exhibition and subsequently uploaded to YouTube (albeit in incomplete form). But now, a complete VHSRip from the legendary lost film's one and only TV airing in 1983 has been uploaded to Cinemageddon by Ricsie! The intro with Vincent Price is missing, but the movie itself is all there. This VHSRip, plus the addition of the bootlegged Vincent Price intro means that Hansel and Gretel has officially been found in its entirety! HUGE thanks go out to Ricsie and his source for finally bringing this gem to light; I encourage any and all CG users reading this to send some credits his way, I certainly will be! For those without CG accounts, I have mirrored the film via mega.co.nz; and you know what? I think this calls for a celebration, so, lockdown is over! I'm ending it a little early, though we got pretty close to the desired goal, so I'm happy. For those who haven't been lurking the Shoutbox of late, I was recently given the opportunity to purchase a bootleg DVD of the full American History X workprint (from a party that wishes to remain anonymous); of course, I took them up on their offer and have since ripped, re-encoded and uploaded it to mega.co.nz for all to see. Enjoy! In other news, lockdown is nearly into its second (and hopefully final) week, so hold off on posting any new articles for just a bit longer. We're getting there; thanks for your patience, it is greatly appreciated. It's unfortunate that it's come to this, but something really needed to be done about the amount of poorly written articles with total disregard for the article creation rules that are becoming more and more frequent. Below you'll find an FAQ outlining exactly how the lockdown will work. If you are an article contributor, READ THIS CAREFULLY! Q: What do you mean by lockdown? A: The term "lockdown" infers, specifically, that no articles are allowed to be added during this period. Any articles that are added will be removed and their authors issued a 2 week ban. Consider this your first and last warning. Q: When will the lockdown end? A: Once all of the insufficient, plagiarised or poorly formatted articles are fixed up or removed where appropriate. Q: What if someone posts a good article during the lockdown? A: The article will be deleted and a ban still issued, however, upon the completion of the lockdown, said article will be undeleted and added to the listing. We are going to have to enforce this rule strongly across the board if we want to successfully combat this issue and as such, there will be zero tolerance when it comes to articles that are posted during the lockdown. Q: Which articles need fixing? A: You can find a comprehensive, growing list of articles that need fixing, as well as exactly what needs to be fixed, here. OK, I think that pretty much covers it. Again, I am sorry that it has come to this, but I really don't want the wiki to turn into just a barrage of crappy articles, with a few goods ones scattered throughout. We had such a productive year last year, let's bring the wiki back to that state. Remember, quality over quantity. I understand that the reception of the lockdown hasn't entirely been positive. Don't get me wrong, I completely understand why it would hurt some of your guys' feelings to not be able to add new content. Here's the thing, though. If we want outside sources to help us uncover lost media, we have to be able to present ourselves in a professional manner. While many of your guys' articles have been wonderfully written and have done nothing but help in our cause, there are quite a few articles that either plagiarize or are just slapped together sloppily. We seriously aren't trying to be mean about this. We just want to be able to accomplish the mission of this wiki: uncovering rare and lost media. We want creators and people who hold copies to feel like they are contributing to saving lost culture, not just handing something over to people who don't care about quality. Thank you for your patience, and please understand that we're just trying to help the wiki grow and expand. That's right folks; the astronomically rare film Cards of Death is finally getting a re-release, on the very format it was shot on, VHS! The release is the first of four planned, yearly offerings from Bleeding Skull Video, a new VHS label created by Joseph A. Ziemba and Zack Carlson, (from bleedingskull.com), in collaboration with Mondo Video. Ziemba and Carlson unveiled the release at the recent Severed VHS Convention in Pennsylvania, with a worldwide release date of June 24th (albeit, in limited numbers). HUGE thanks to all involved in getting this film out to the people who have so desperately wanted to see it (myself included)! 45 minutes of Canzo Empyrean. A large chunk of Justin Fornal's bizarre underground G.I. Joe film adaptation Canzo Empyrean has appeared online for the first time, courtesy of YouTuber Joshua Kane! It was uploaded exactly two months ago, on March 18th and has gone largely unnoticed until now. It is unclear whether this is the entire film or not (it's hard to determine much, due to the film's incredibly bizarre nature). In any case, this is an outstanding development! Big thanks to Joshua Kane for providing said footage and to Shoutbox poster GameMachineJames for bringing the upload to our attention! P.S. I am working on getting Terrifying 9.11 ripped and out to you guys, but I am currently having issues with the GB Transferer II. Hang in there; sooner or later, it's coming. UPDATE 21 May '14: We have recently been informed by uploader Joshua Kane that the 45 minute video is not, in fact, the movie itself, but rather a compilation of all the footage that has been publicly released to date. He also informed us that the actual film has a runtime of over 2 hours and contains a fight scene that takes place on the Brooklyn Bridge. Oh well; despite not being the full thing, it's still pretty cool to see all of the released footage in a single, linear video. An interview with Roger Christian (recorded earlier this year) on the creation of Black Angel. A couple of days ago, Roger Christian made the announcement (via coffeewithkenobi.com and Twitter) that Black Angel is now officially available for digital pre-order on iTunes, with a release date of May 20th! Without wanting to sound too much like an advertisement, it's really quite affordable, (considering its historical significance), at just $2.99 for the HD version and $1.99 for the SD one. Anyway, I have mine on pre-order and am eagerly awaiting May 20th, as I imagine many of you are; big thanks are due to all involved in restoring this film and getting it out to the mass audience it deserves! HomeStarRunnerTron, after recently discovering an eBay auction for the rare, out-of-print, self titled Keep Left album (featuring Dan Povenmire, co-creator of Phineas & Ferb), promptly snatched it up and has since provided a rip for download (complete with scans)! The album can be downloaded here in mp3 format and here in FLAC; additionally, the 8 scans seen above are available in a nice, tidy .zip file here. Big thanks to HomeStarRunnerTron for sharing this rarity with the community! Touli article author The Reynard recently discovered and brought to our attention that an episode of the French stop-motion animated series had been uploaded to Persian video sharing site zamanema.com! The episode has since been mirrored on YouTube, (as well as mega.co.nz), courtesy of PepsiWithCoke (aka bearfan121) and can be seen above. It should also be noted that the found episode's opening theme is an instrumental version, lacking any lyrics (probably as the result of it being sourced from a foreign airing). Youri episode begins at 18:32. Last night, while going through some old VHS tapes, I came across a copy of the J-Horror Dark Water, as recorded by myself in 2005 off Australia's Special Broadcasting Service (SBS). To my surprise, the tape also included an additional "Happy Tree Friends and Friends" block. Lo and behold, said block contained another episode of Youri, the Spaceman! I'm a bit puzzled as to how I managed to miss this one for so long; I could have sworn that I'd already gone through all my old tapes scouring for episodes, but what'dya know. In other news, I've decided to conduct a t-shirt giveaway in an effort to gain additional YouTube subscribers. I will be giving away 3 shirts to 3 randomly chosen subscribers to our YouTube channel; competition entries will be cut off once the total number of subscriptions hits 1000, with 3 of the 1000 subscribers receiving a t-shirt of their selected size and colour. So, if you haven't yet subscribed to our YouTube channel and would like a chance to win a free shirt, head on over there and click subscribe. Thanks and good luck! The track, titled "Smile", was recently uploaded to Chino Moreno's official YouTube account to commemorate the one year anniversary of bassist Chi Cheng's passing. In addition to this gesture, Moreno also tweeted a link to the video with the message "Chi, We miss you today and everyday. -deftones". Heartfelt thanks to Deftones for this moving and bittersweet tribute; RIP Chi. UPDATE 15 Apr '14: Warner Music Group has since (rather disrespectfully, in my opinion) brought a copyright claim against the upload and has subsequently had it removed. It is currently being mirrored above via our Lost Media Wiki YouTube channel. 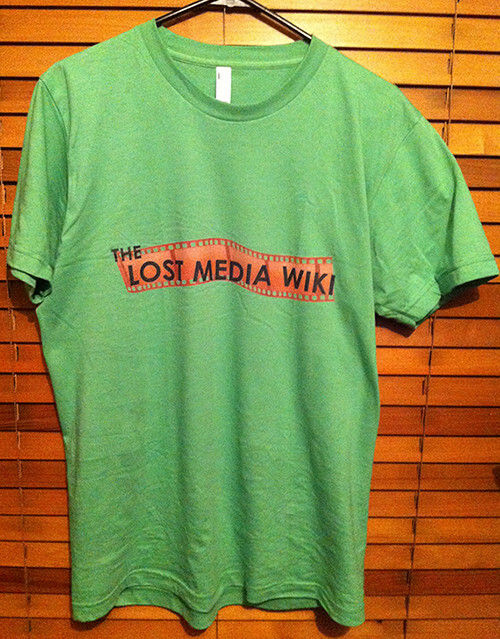 Hey everybody, just a quick Notice Board post today to let you all know that Lost Media Wiki t-shirts (not unlike this one) and hoodies are now officially available via redbubble.com! a) Advertise the site, getting it more exposure. c) To pay for the translation of previously lost pieces of found media. So, if you feel like grabbing a shirt or hoodie and supporting the wiki at the same time, head on over the redbubble.com link below (or simply click either of the above two images). That's about it for now; thanks guys! A little under a week ago, The Alan Parsons Project's previously long-unreleased album The Sicilian Defence was officially made available as a part of The Complete Albums Collection, an Alan Parsons Project boxset, as released on the 31st of March; said album has since (inevitably) found its way to YouTube. Alan Parsons himself has stated on several occasions that the album was created with very little effort or enthusiasm, as the result of a contractual dispute between the band and Arista Records, (resulting in the album being shelved in the first place), so don't expect too much from this. Having said that, it's certainly a fascinating listen given its history and the fact that it has not been heard by the general public in the 30+ years since its initial recording. Thanks and respect to The Alan Parsons Project for finally releasing the controversial and mysterious album (despite the circumstances surrounding it)! The 40 minute album can listened to in its entirety via the above video. Anyway, you'll be pleased to know that we're back to regular wiki business; thanks for not freaking out too much and for all the concerned (and sometimes derogatory) Shoutbox comments; it's touching to know that people care about this place so much. Sorry if we (ie. prank masterminds ThatShoegazer and myself) dragged this out a little longer than necessary, we just wanted to fool as many people as possible. For the record, I have no plans of ever relinquishing ownership of the wiki, commercialising it, or changing it from its current model. On one final note, thanks to the dudes over at the Creepypasta Wiki for being such good sports about the prank! Cruel Ghost Legend (now with optional English subtitles). Cruel Ghost Legend, the recently found, obscure Japanese horror film from 1968 can now be enjoyed by English audiences, thanks to the creation and provision of English subtitles by cinemageddon.net users Scannon (who translated the film) and lordretsudo (who timed the subs)! The subtitles in question have been added to the Cruel Ghost Legend upload on our YouTube channel and can be accessed via the closed captioning options, or, alternatively, both the subtitle file and original 6GB VHSRip (along with a 660MB compression of said VHSRip) are available at cinemageddon.net (mega.co.nz mirrors to come soon; I've been meaning to mirror this film for a while, but haven't had the chance to upload the massive, uncompressed source file). Big thanks to both Scannon and lordretsudo for creating and making these subtitles available! Episode 02 - "Fifteen Minutes". Episode 03 - "Blind Dates". Episode 04 - "Whose Life Is It Anyway?" (Reworked Pilot). Episode 05 - "The Sopranos Come to Dinner". Episode 07 - "The Sidekick". Episode 08 - "Snow Day" (Unaired). Wow, what a month! And with no signs of slowing down, yet another piece of lost media (or rather, several pieces) has come to light in the form of nine of the eleven filmed episodes of the Emeril sitcom, including two that were never even aired! Big, big thanks go out to collector Vinnie Rattolle who has been kind enough to upload his personal copies to YouTube for all to see; special mention to Shoutbox user shitasticularthesquel for originally bringing the uploads to our attention. While two additionally filmed, unaired episodes (ie. Episodes 10 and 11, "The Retreat" and "My Grandmother's Cornbread", respectively) have yet to see the light of day, this is an outstanding development nonetheless, considering that not a single episode was publicly available until now. Thanks again, Vinnie! P.S. Incase you happened to have missed the last Notice Board post, Garage is now available! Yep, you read correctly; Garage has arrived! For those who haven't been following the situation over the past month and a bit, a copy of the game was recently put up on Yahoo Auctions Japan and was subsequently snapped up by hg101.proboards.com user cc0 (aka Mid Heavens in my Garagesan ! !OUMLpH0sZpD on 4chan's /vr/ board). After a lengthy trip from Japan, to the U.S., to Australia (due to potential issues regarding Australian customs), the game arrived today and has been ripped for all to download! You can get the CloneCD image here, or if you're a Mac user, you can get the .dmg file here. HUGE thanks to cc0 for spending a whopping 77,000 yen (roughly 1,000 AUD after processing fees and the like) on this highly sought-after work of art and for freely sharing it around so quickly! You really pulled through for us and I for one am immensely grateful. On a technical note, I've had success running this game in Windows XP SP1, through VirtualBox, though some tinkering was required. If you need any assistance on getting Garage up and running, feel free to shoot me a line and I'll happily assist wherever possible. UPDATE 21 Mar '14: Following the game's upload, cc0 has also graciously provided a collection of scans and photographs (of the manual, box, case inlay, disc and included map), which can be obtained here. Thanks again, cc0! Three Whatever Happened to... Robot Jones? episodes in their original dub. "Prometheus and Bob - Glue" segment allegedly from "KaFun!". "Action League Now! - And Justice for None" segment allegedly from "KaFun!". "Pizza Rocket" musical segment allegedly from "KaFun!". "Untalkative Bunny" segment allegedly from "KaFun!". The Alan Parsons Project boxset The Complete Albums Collection, including The Sicilian Defence. Bootleg screenshot from Mess O' Blues. Cruel Ghost Legend has been found! Huge thanks to an online acquaintance of mine (who wishes to remain anonymous) for tracking down a VHS copy of the film, ripping and subsequently providing it to me! The film is unsubtitled as of this point in time, but I have managed to track down a karagarga.net user who is willing to transcribe it for us if we are able to raise a bounty of 200GB upload credit on said website (more details to come later, along with the uncompressed 6GB source file). A complete episode of JBVO has been found, cartoons and all! It was originally uploaded to myspleen.org early last month by user retroccn as part of a January 2001 "Cartoon Cartoon Fridays" block, but has recently been reuploaded as a separate video, after retroccn read that the series was somewhat sought-after here on the wiki. Thanks retroccn! Direct download mirror to source file available here. Three Whatever Happened to... Robot Jones? episodes have surfaced in their original dub! They were uploaded by YouTuber CartoonArchive late last month; thanks go out to CartoonArchive (for the upload) and to Allanvideohq (for letting us know). Several pieces of footage from the KaBlam! episode "KaFun!" have seemingly been uncovered! These pieces of footage consist of a title screen from a supposed Japanese airing of the episode, along with four segments which are alleged to have aired during said episode. Thanks to all those involved in uncovering this information and bringing it to our attention. The Alan Parsons Project's unreleased album The Sicilian Defence is receiving an official release! The album is set to be released at the end of the month as part of a new Alan Parsons Project boxset, The Complete Albums Collection. Thanks to ThatShoegazer for bringing this news to light. A bootleg (ie. photographed) screenshot from the Johnny Bravo prototype short Mess O' Blues has been unearthed! Thanks to Uncle Sporkums for bringing this to everyone's attention and, of course, to the source of the photo (the identify of whom currently eludes me). Finally, backup copies of episodes 2 and 5 of The Popcorn Kid have been uploaded to the wiki's YouTube account, following the suspension of mantronix4ever's account (to which the videos were originally uploaded). Well, that was a mouthful. Don't forget about the Trove alpha key competition; each Discluded article fixed up will earn you an entry into the draw, with no maximum amount of entries (see the Old Notice Board Posts page for further information). Good luck to everyone who participates! "Let's Play Trove Alpha" episode 1, courtesy of YouTuber StoneLegion.com. Trove is a recently released sandbox voxel MMO by Trion Worlds, currently in closed alpha. I've been playing it for several months now and have been having a great time. It's kind of like a cross between Minecraft and Cube World (both of which I am also particularly fond of, so naturally this game was right up my alley), with a bunch of its own original ideas to boot. Now, why am I telling you this? Let me explain... Over the past few months, the frequency of sumbitted articles has increased significantly, so much so that I am no longer able to maintain them all by myself. A lot of the newer articles need either grammatical/formatting fixing, or simply need more content. These articles are largely things that should have probably been included in the Discluded category, though I decided to give them the benefit of the doubt and include them in the listing anyway (reserving the Discluded category for only the most incomplete of articles). So, here is the deal: anyone who competently fixes up a discluded article, as of this point in time, will go into a randomly drawn prize pool to win a Trove alpha key (it just so happens that I have a spare and am willing to give it away for the benefit of the wiki). The more articles you fix up, the more times you will be entered into the draw; I'll leave this offer open for at least a week, with a set draw date to be announced soon. Thanks to anyone who decides to help and good luck! P.S. I haven't forgotten about the pieces of recently found media that still need a Notice Board post; a BIG one is coming soon. Callin' Out To Jesus In The Middle Of The Night/White Nights. Serbian dub of "Dead, or Alive", a rare The Legend of Calamity Jane episode. It was recently brought to our attention that a rare Lift to Experience/The Autums split 7" vinyl, Callin' Out To Jesus In The Middle Of The Night/White Nights (the former of the two songs being performed by Lift to Experience) was purchased, ripped and uploaded to YouTube in late December of last year! Thanks to ThatShoegazer for tipping us off and a big thanks to YouTuber Eyes Like Propellers for bringing this rarity to light! In other news, it has been discovered that a Serbian dub of "Dead, or Alive", (a rare The Legend of Calamity Jane episode that was thought to be completely missing) was uploaded to YouTube all the way back in March of last year! While two episodes remain missing in their original English dub, this is still an interesting development. Thanks to YouTuber SvetAnimacije for uploading the Serbian dubbed episode and to PoundPuppies10fan1 for making its presence known! Lastly, (since I've seen people mention it several times in the shoutbox), the full, uncensored Ricardo Lopez tapes are now available for download in either .avi, .flv or their original source .mp4 formats, links courtesy of glbracer. If you happened to have been trawling the shoutbox over the past few days, you're probably aware of a slightly controversial topic that came up, that being the uploading of the sought-after An Off-Beats Valentine's special that occurred a couple of weeks ago (on Valentine's day, to be precise). The catch here was that the upload was forbidden from being shared anywhere besides its source website (a private, invite only website, the name of which we were not even allowed to know), a concept which I wholeheartedly disagree with. It is my pleasure to announce that an anonymous user of said website has sent me the raw file, which I have uploaded to YouTube. Thanks to the anonymous sender and a big thanks to the original ripper (whoever they may be). A direct download of the raw file is available here. Adam Temple's Gravity Falls pilot highlight reel. The Angry Beavers "Snowbound" pilot (DVDRip). House of Cool's Gravity Falls pilot highlight reel. Hey guys. How many of you remember seeing the bootleg copy of the The Angry Beavers pilot "Snowbound" that was included in the "Cuffed Together" pilot article? Well, a DVDRip is now available, courtesy of Eddy's Uploads over at YouTube; thanks Eddy! Notably, on closer inspection, the original source of the pilot seems to be a VHS tape... Interesting. In other news, more footage from the Gravity Falls pitch pilot has come to light, in the form of a short pilot highlight reel from House of Cool, the studio behind the pilot's creation! Thanks to an anonymous contributor for bringing this to our attention, and to YouTuber TheMysteryofGF for creating a mirror of the reel! Super Bowl II highlight footage. King of the Hill/Silver Surfer crossover commercial. Weird-Oh's episode "Headlocks for Homework". Schoolyard Safari episode "Class Clown". Schoolyard Safari episode "Brush With A Bully". Super Bowl II has been found! It was uploaded in late November of last year, and has gone by largely unnoticed until now. It was provided by the official YouTube SuperBowl channel. My mistake, it seems that this is not the entire broadcast, nor is it even the entire game (that'll teach me not to frivolously report things without independently verifying them first). Still, 22 minutes of highlight footage is better than nothing. The rare King of the Hill/Silver Surfer crossover commercial has been found! It was recently uploaded by YouTuber MiDSinister. Several episodes of Weird-Oh's have been found! They are being provided by Lost Media Wiki contributor Believer07, who has begun creating bootleg recordings from his own personal Volume 2 VHS tape (one episode of which, "Headlocks For Homework", can be seen above). A promo for the Emeril sitcom has been found! It was upped in early December last year by YouTuber Jamie Gee, and is the first piece of widely available video footage from the show. Two more episodes of Schoolyard Safari have been found! They were officially provided by funnyazhellanimation.com, the group who created the series. Thanks to compn over at the myspleen.org forum for originally tipping us off. The Lost Media Wiki forum has been re-enabled (for the time being, at least). You can check it out now via the top "On the Wiki" menu. Thanks again to all parties responsible for making these pieces of media available! Keep an eye on glbracer's Ricardo Lopez Tapes YouTube playlist for future installments and, as always, be mindful that said tapes are of a disturbing nature and, as such, should be viewed with caution. NOTE: Hours 6 and 10 of the Lopez tapes have been removed by YouTube. See here for an explanation. The uploading of the second half of the Lopez tapes is officially underway; we're now more than two thirds of the way to having all 18 hours widely available! Thanks again to bun39 (for securing the tapes), to his anonymous source, and to glbracer (for providing YouTube mirrors). P.S. Just a friendly reminder that these tapes are of a disturbing nature, and as such, should be viewed with caution. Schoolyard Safari "Flocking the Field", courtesy of Dr.Unique. While many await the release of the final half of the Ricardo Lopez tapes, here's a little something to tide you over. Thanks to shoutbox contributor Dr.Unique (aka Rareth Maneth on YouTube), one of the missing Schoolyard Safari shorts (ie. "Flocking the Field") has been ripped and uploaded (just a few days back, and from their own personal collection, no less)! Fans are now one step closer to securing the entire series of nostalgic shorts; thanks again Dr.Unique! Stay tuned to the Notice Board for updates on the forthcoming Lopez tapes. Huge thanks to bun39, who has been in contact with someone who owns the full 18 hours, and, of course, to said anonymous source. As they will be uploaded in hourly installments, stay tuned to this announcement for future videos. You can see the YouTube playlist above, (uploads courtesy of glbracer), which will be updated as new footage emerges. The first track from Luci's Love Child. Nobody Knows How to Talk to Children. What better way to start off the new year, than with two recently made discoveries; that being that Red Abyss' Luci's Love Child had been uploaded in full to YouTube, by user Rockbitchtribute Page, (between December 09 and 19, 2013), and that the rare The White Stripes documentary Nobody Knows How To Talk To Children had too been uploaded (all the way back on March 18 of last year; talk about a sleeper upload!). Big thanks to Rockbitchtribute Page and Max Pozdnyakov for the respective uploads, and to CDCB2 and the anonymous wikia contributor for tipping us off!